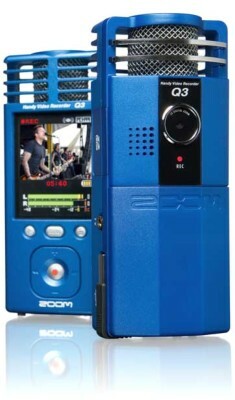 The Zoom Q3 Handy Video Recorder is a portable audio recorder with an integrated digital video camcorder. It has a fun look and a nifty, bright blue, matte finish. In the hand, it feels smooth and solid even though its body is made entirely of plastic. With dimensions roughly 5" x 2" x 1.25", it can easily fit in a coat pocket. Its 2.4" LCD display is bright and clear. As you shoot, you can zoom in and out and set and monitor levels. The buttons are fairly crisp and logically laid out. A tripod socket and three tiny rubber feet on the bottom offer plenty of options for stability. A USB cable is cleverly built into the unit as well. The HandyShare software is very basic and works only when the Q3 is connected to your computer. The accessories included are all you need to get started, but an AC adapter would have been nice. An AC adapter (AD-14) and a mic clip adapter are available from Zoom as optional accessories. It's easy to make recordings with the Zoom Q3. If you are comfortable using a computer, you will be very comfortable using the Zoom Q3. Very little menu surfing is required. The slim, brochure-like Quick Start Guide truly guides you through the steps required to prepare the unit. Choose between video or audio only recording modes with a switch on the side of the unit. Set the mic gain (Low/Medium/Auto) with another switch. In ready mode, press the "+" button to set recording levels and press the "<<" button to zoom in or out. Press the REC button to start recording. Press it again to stop. Press the PLAY button to watch or listen to what you recorded via the LCD and speaker monitor. Easy. The Q3 is Windows and Mac OS compatible. The Zoom Q3 comes with a 2GB SD card but can accept secure digital media cards up to 32GB in size. In movie mode with audio set at 320 kbps mp3, the included 2GB card will last about one hour. In audio-only mode at 320 kbps mp3, the 2GB card will last almost 14 hours. Transfer recorded movie and audio files to your computer via the built-in USB cable. The USB 2.0 connection is fast - a 5-minute movie with audio set at 44.1 kHz/24-bit wav copied in about 3 minutes. In addition to its built-in USB cable, the Zoom Q3 has a combination 1/8" line out/headphone jack and a 1/8" AV out jack to connect to a TV. It has no external mic or line input jacks. Review the specifications in more detail at Zoom's website and review the Zoom Q3 QuickStart Guide before you decide to buy. Acceptable, considering what it does. The Q3 lasted 1.6 hours in movie mode and 2.6 hours in audio-only mode during our battery life test. Acquisition of the optional AC adapter may be critical for some folks. The two microphone capsules in the Zoom Q3 are the same as those in the H4n Handy Recorder, fixed in an X/Y stereo configuration with a directional pick-up pattern. Audio formats with video are 44.1/48kHz 16/24-bit WAV or MP3. Audio-only formats are from 96kHz 16/24-bit Linear PCM WAV to MP3. The Zoom Q3 is a well-made, well-designed and easy-to-use recorder that sounds good too. We can honestly say that it is the simplest and most straightforward recorder by Zoom that we've ever seen, even with the video recording feature. At $249, the Q3 is a great bargain. We are happy to add it to our selection of portable recorders.